A dynamic, interactive, web-GIS based map focusing on trail-related ecotourism along the Trans Canada Trail as it travels through the City of Kawartha Lakes, Peterborough and Northumberland Counties. The primary purpose of the map is to aid and promote trail use, while connecting users to local business relevant to the trail and trail-related tourism. 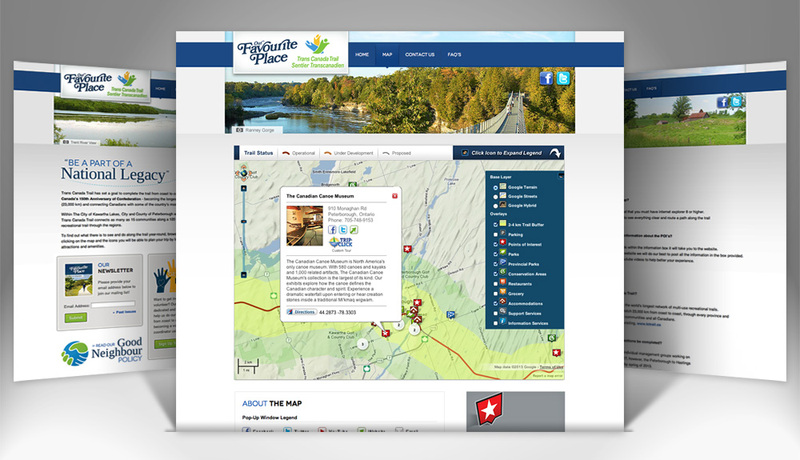 As well as housing the map, the website provides additional trail information and acts as a useful tool for connecting to the community, landowners, and stewardship groups. Forsefield developed and managed a number of GIS datasets related to the trail, including local businesses, natural features, and points of interest. This data was used to create the web-GIS based map, as well as a series of printed map products. Effective geographic data management and cartographic design was critical to the final success of the interactive map. It was necessary to compile datasets from multiple sources to create the final data that is displayed in the map. Careful cartographic design and planning was required to effectively display large amounts of information on the map while maintaining a strong visual impression and ease of use for visitors to the Our Favourite Trail website. 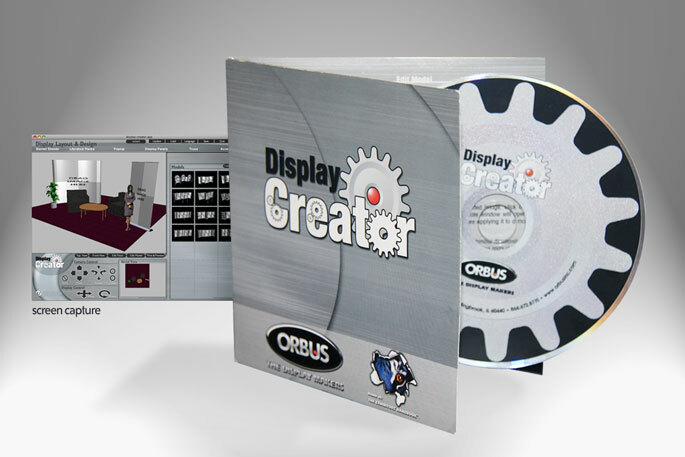 Unique and revolutionary software tool developed for Orbus Inc. in the U.S.A., and Ultima Displays in Canada and Great Britain. This software was created to allow non-CAD designers to quickly and easily produce a complete 3D visualization of portable or modular trade show booths. The 3D scenes can be created, saved, printed, or e-mailed directly from the software interface. All 3D models are customizable by changing size, colour, texture, and graphics using only a few clicks with the interface. Forsefield was responsible for creating object oriented 3D software that would be simple to use.The identity of the project, the design, function,module updating website, and user interface was developed by Forsefield as well as the the packaging design and user manual. Once the software was installed, users could download new modules, from a micro-site, with updated functions, and 3D models as the clients product line expanded. Creating a simple to use interface that produces complex, fully customizable 3D trade show environments. Camera controls, 3D object positioning and image mapping is usually requires knowledge of complicated 3D software and an above average understanding of 3D files, and computers in general. Controls for Display Creator were designed to be intuitive and user friendly. 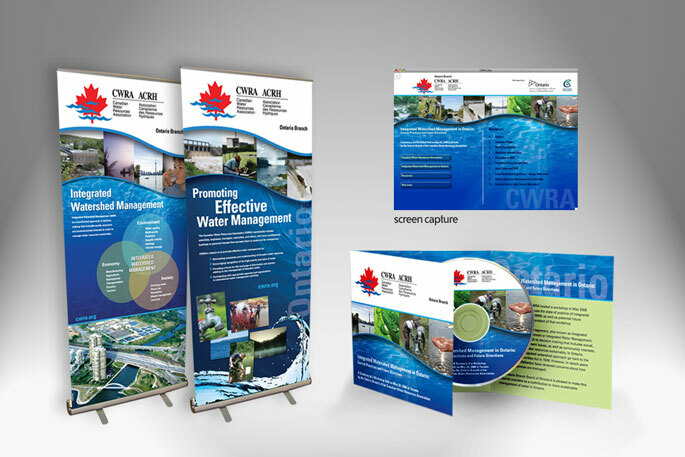 A summary of a workshop held onMay 28, 2008 in Toronto by the Ontario Branch of the Canadian Water Resources Association. This interactive CD was used to distribute valuable information compiled into one convenient package. Forsefield created an interactive user interface to present the information included on the CD-ROM. PDF documents and links to external websites were directly accessible with an easy to navigate menu system. Sounds and graphics were used with rollover animation techniques to add interest and interactivity. The organization of many related links and documents into an easy to navigate menu system. Creating a themed design that would carry across multiple formats including; interactive menu screens, CD packaging, and a large trade show banner graphic. Forsefield was responsible for the design of this project from concept to production. All elements were sourced and produced by Forsefield including: large format printing, banner hardware and CD replication. A 32 page book on the history of Psoriasis. The book was created as a give-away item for “Genentech”. The Taylor Group had designed a large trade show booth focusing on the history of this disease and the treatments available from their client “Genentech". With graphics already in place for their latest trade show booth design, The Taylor Group contracted Forsefield for the design and production of the promotional give-away. Forsefield sourced all images, and layed out the entire book from a supplied Word Document. Forsefield was responsible for the production and shipping of this product to meet a very short deadline before the event. Forsefield spent many hours researching the content of the project and gaining an understanding of the history of Psoriasis. 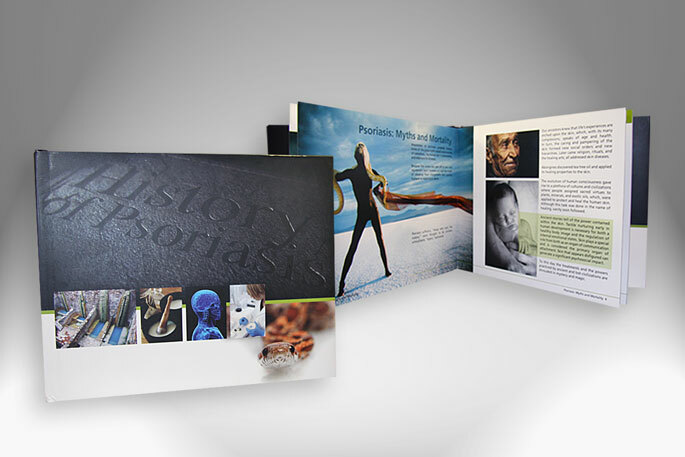 Our focus was on visually communicating the history and science behind an ugly disease while producing an attractive, informative, and interesting coffee table styled book. With such a heavy subject matter, we created a balance by designing each section of the book with an individual layout style. While type treatments and overall grid remained, the colours and photo effects were manipulated to create different tones and moods throughout the pages.